Innovation is all around us, yet it’s not always so easy to uncover. Organizations have the opportunity every day to promote a culture of recognition and inspire innovation from employees. Appreciating employees is an everyday thing here at Achievers, so in honor of Employee Appreciation Week 2015, we thought we’d share some of our favorite links on innovation to inspire recognition—and innovation—today! How are you recognizing your colleagues for Employee Appreciation Week? This month, Brandon Hall Group released their recent Employee Engagement Survey, which suggested that a strategic employee engagement solution dramatically impacts an organization’s bottom line. For many companies, investing in social recognition solutions has had an incredible impact on retention, performance and productivity. But how can HR professionals use social recognition to successfully implement an employee engagement program and align their employees to their organization’s values and business objectives? Read on for three keys to understanding social recognition for HR professionals, and how to build the business case for implementing a social recognition solution..
Only 32% of organizations have implemented formal engagement strategies. And just about everyone else relies on engagement surveys conducted by HR teams. While surveys can provide insight into the health of the organization, they represent a static point in the past, and fail to capture engagement in real time. Brandon Hall Group’s research revealed that one key to a comprehensive, long-term employee engagement strategy is consistent recognition. Adopting a social recognition platform brings employee success to life and increases engagement levels, boosting organizational performance. Many businesses use monetary incentives as tools to engage their employees. Brandon Hall Group urges organizations to think differently when it comes to employee engagement. Although monetary rewards can easily be paired with a recognition, the power of social recognition shouldn’t be overlooked. Today’s modern workforce values immediate feedback, and uses it as a springboard for innovation. When employees experience immediate recognition for their contributions, it naturally increases recognition levels across the organization, further driving business results and establishing a culture of recognition. In order for companies to effectively boost engagement levels, they need to ensure that recognition is part of the culture. The best way to facilitate this is by implementing a social recognition platform. From there, leaders can use the tool to align individual performance, productivity and engagement to company performance. The link between engagement and productivity is innate: employees who are engaged at work are driven to outperform. Learn more about how investing in a social recognition platform can positively impact your business. 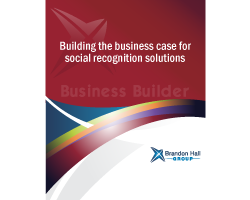 Download the Brandon Hall Group report, Building the business case for social recognition solutions. 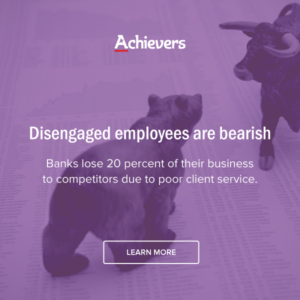 The financial services and banking industries don’t fare well when it comes to employee engagement. When compared to all other industries, finance and banking suffer from high customer-switching rates, low employee engagement levels, high turnover, and absenteeism. Ouch. For banks, 20 percent of lost business to competitors was due to poor service, ranking higher than internet service providers (18 percent), and even wireless phone companies (17 percent). Your clients’ reach and access to knowledge is wider than ever before. Now that your prospective and current clients can instantly get access to information about your company and your competitors, they can make quick decisions about which companies they want to do business with. This makes customer-switching extremely problematic for businesses—which is typically the outcome after a poor customer service experience. Recognize your employees for providing outstanding service to clients in order to combat customer-switching and reinforce positive behaviors you want repeated. Total costs related to absenteeism amount to $84 billion annually. A decrease of only 10 percent in employee absence could produce a one to two percent savings in payroll costs. When employees are disengaged, being at work is the last place where they want to spend their time. Unfortunately for banking and financial services companies, this means that absenteeism has a significant impact on productivity and payroll costs. It’s not an easy problem to tackle, but aligning your employees to business objectives is one way you can infuse more meaning into employees’ work, making them feel like the valued contributors that they are. The number one reason employees quit after financial considerations is lack of recognition, and 65 percent of employees don’t feel recognized at work. The numbers speak for themselves: organizations with high engagement rates are 78 percent more profitable than organizations with low levels of engagement. This means that engagement really does have a strong impact on business results. Financial services and banking executives need to get on board with an employee recognition strategy, and can start by explaining the business benefits and potential growth the organization could achieve with an engaged workforce. At 17.2 percent, banking and finance employees mark the industry with the highest turnover rates. When banking employees leave their business, they take years of experience, skills, and potentially even clients with them. This is a real problem for the industry. Reducing turnover rates starts with understanding the problem, and making an effective strategy to combat turnover. Consider deploying an employee engagement survey to understand how and if employees feel connected to the business. From there, develop an engagement strategy that specifically aligns with the outcomes of the survey. Download our latest whitepaper, and learn more about the cost of disengagement to the financial services and banking industry. When it comes to driving repeat purchases in retail, customer experience is just as important as price, if not more so. With your employees at the forefront, bringing positive or not-so-positive experiences to your customers, it’s important for retail leaders to work with a highly engaged team. Get the fast facts and learn how disengaged employees affect consumers and what you can do to improve engagement levels. FACT 1: Disengaged employees fire customers. The retail industry saw 28% of global consumers switch due to poor customer service in 2013, compared to 22% in 2012. Ouch! As if the economy and changing consumer tastes weren’t enough, retailers and brands are now losing loyal customers due to poor service. And that’s not all. Of all industries, retail has had the highest percentage of consumers who switch due to poor customer experiences. How can you engage your employees and empower them to deliver exceptional service? Be transparent: Help employees understand how consumer interactions affect the bottom line. Timely recognition: Give your employees kudos on-the-spot when they provide excellent service. Utilize feedback: Allow your customers to give feedback and share it with your employees. A decrease of only 10% in employee absence could produce a 1-2% savings in payroll costs. Improve the culture: Create a positive environment where employees feel excited to come to work. Create alignment: Get employees in sync with the organization’s objectives so they understand how they contribute to the business. Use peer-to-peer recognition: It’s great to get feedback from the top down, but peer to peer recognition is a powerful tool as well. FACT 3: Disengaged employees will leave your company. More than 50% of disengaged retail employees are planning to switch jobs in the next year, versus 10% of engaged employees. High retention rates are indicative of engaged employees. Engaged employees are putting your customers first and ultimately driving the bottom line. Consider practices that your business could adopt to help boost retention rates and keep business booming. Engage employees: Practice recognition when employees meet a business objective. Develop a recognition rhythm: Get all of your employees in the habit of recognizing each other on a regular basis. Evolve your engagement strategy: Ditch antiquated ways of rewarding employees and use positive and timely feedback. Learn more about how your business can improve the customer experience by engaging employees. Download our whitepaper, The Cost of Disengagement for the Retail Industry. Ryan LLC drives total client satisfaction by aligning its global employees with the Achievers Employee Success Platform™. Watch the video and see how Ryan LLC creates a culture of recognition to drive success. Don’t get me wrong; I learned a lot from HR Tech Europe in Amsterdam, and thoroughly enjoyed my experience. The sessions were great. Connecting with several analysts and the media was enlightening. The people I met in the Spire bar as we passed around red drink tickets and stories were plenty and inspiring. 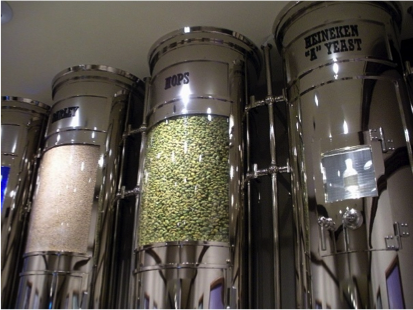 But, the biggest takeaway from my first HR Tech Europe experience didn’t happen at the show; it happened at an old Heineken Brewery. With two fellow Achievers (as you can see by my pictures below with amazing colleagues Loren and Katie; we had a great time), we took part in the Heineken Experience. On Saturday afternoon after HR Tech, we spent three hours learning about the quality of Heineken beer and had a few (ok, a lot of) samples. But what stood out most for me wasn’t the product, or the brilliant Heineken marketing, or the fun experience and copious amounts of silly pictures—it was that Heineken’s unwavering focus on their people continues to make this company great. Throughout the experience, it was obvious that Heineken creates a culture where their people, and in turn their company, can thrive. It starts with a dedicated room that shows a video from their Executive Director of their Board, Charlene Lucille de Carvalho-Heineken, describing the values of Respect, Quality and Enjoyment. She comments on how every decision the company makes flourishes from these values, creating an aligned purpose. There’s a wall of stories describing how the leadership was insanely focused on putting their people first. In one story from 1923, Heineken became one of the first Dutch companies to establish a non-contributory pension fund for its employees. In 1929, a decade after an economic crisis, Heineken refused to fire or lay off employees, and instead provided early retirement options at age 58. In 1937, they developed The Heineken Foundation for Personnel to provide extra support for employees in need. Decades later, Heineken continues to focus on innovating great culture fit, earning them awards around the world for their focus on employees. Seriously, this company is amazing—just check out their latest hiring campaign. The people I met embody everything we all want in our employees. They’re focused, energized, passionate, and engaged. Listening to—and watching—them speak about the product was inspiring, and more akin to a parent talking about their newborn child. The woman providing us our first sample didn’t call it “yellow beer,” she called it “liquid gold.” And all did it with a passion and confidence that they belonged to the Heineken family. You’d never guess they’d been doing the same thing, hour after hour, over and over, to more than 600,000 visitors so far in 2014. Every interaction, from the gentleman selling us our tickets, to the lovely woman accepting them, to the person that checked out all the things I couldn’t resist from the gift shop, and everyone in between, showed that the employees not only lived and believed in the brand, they’re actively a part of the Heineken journey. And I’m not just talking about people. Heineken’s horses are behind the brew, too. Yup! That’s not a typo. Even the horses are recognized as part of the family with an entire section dedicated to the role horses have played in Heineken’s growth for over 150 years. Horses were the prime method of distribution for the tasty-suds, from the streets of Amsterdam and beyond, up until the 1960’s. They highlighted their importance and displayed their continued purpose. They displayed how they are part of the family. They even have a vacation day each year when all the horses are taken on a field trip to run free in the pastures. They even take care of them after they retire for the remainder of their lives. The horses are as part of the culture as their people. Throughout our tour there were many passionate references to the ‘secret-sauce’ in their beer—affectionately named the ‘A-Yeast’—that keeps Heineken’s taste consistent, in 180 countries worldwide. It reminded me of the importance of alignment, and why company culture is the secret sauce your competition can’t duplicate. There are 20,000 beer brands worldwide that can make a beer with a similar look, feel, taste, and smell as Heineken. And, so it happened that my biggest ‘ah-ha’ from HR Tech Europe came off-site of the event in an old brewery. I urge you as business and HR leaders to consider this: Anyone can build your product and compete in your market. Give a smart kid some money and a laptop and they can probably build a product better than yours—I saw more superior products in the Disrupt HR section of HR Tech than what’s currently out in the market. That means what sets you apart isn’t just in what you build, but who builds it, and why. One of my primary goals as a manager and a leader in two fast-growth companies has been simply this; don’t let a single employee be a passenger. Hire to your company values and culture, and ensure that they have the chance to belong to something they can feel passionate about and engaged with. This includes being transparent, allowing employees to have a voice, having a purpose, mission and values that are clear and lived by senior management (and not just a page on your website), and recognizing and aligning employees with that vision. Isn’t this what HR Tech is all about? All the fancy tools and technologies are great, but so often they aren’t people centric. Technology, tools, platforms—whatever you want to call them—are enablers. They need to enable people to align to the behaviors and values you want every employee to embody, and empower them to do their jobs more effectively and passionately. 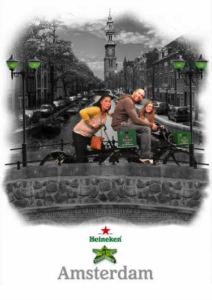 I learned a lot at the Heineken Experience but one other thing was new and cool to me. I was unaware that the three letter e’s in the Heineken logo were turned slightly to make it look like they were smiling. A nice touch for their brand and culture. With the whole experience that day, my fellow Achievers and I had three faces smiling back. While there is sufficient evidence for both sides of this debate, the key take-away is for leaders to constantly focus on improvements and raise the bar. 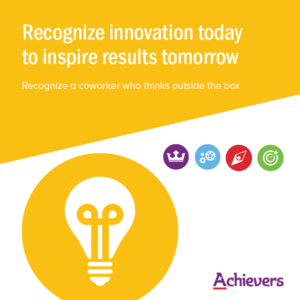 At Achievers, we foster a fast-paced and dynamic workplace where processes evolve based on business opportunities and our organization’s vision to be the global leader in rewards and recognition. The best leaders are able to adapt to constant changes, and strategic thinking is one of their most powerful tools.